Air pollution isn’t limited to the outdoors. Odors, gases, moisture, dust and other debris and irritants can negatively affect indoor air quality. This is especially difficult for those who suffer allergies or have conditions that make breathing more difficult. 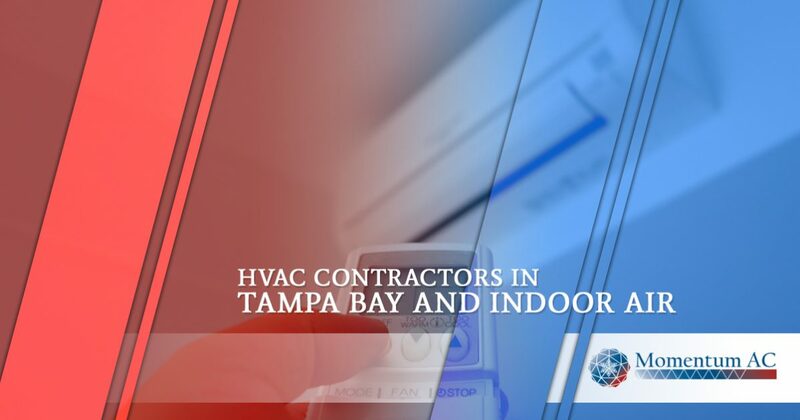 Momentum AC, your HVAC contractor in Tampa Bay, offers ways you can maintain good air quality inside your home. The benefits of houseplants can never be overstated. Houseplants actually breathe and clean the air. They take carbon dioxide from the air and breathe out oxygen. It is just the opposite of what we do, which is breathe in oxygen and expel carbon dioxide. By bringing plants into your home, you are creating a symbiotic relationship in which plants filter the air, beautify your home and create fresh oxygen. Some houseplants you may want to consider include aloes plants, bamboo palm, English ivy and red-edged dracaena. The air filter in your HVAC system is your front line of defense against poor indoor air quality. A typical HVAC system will circulate over 1,000 cubic feet of air through the filter every minute. This means all of the air volume in your home passes through the filter multiple time a day. A clean filter is a filter that effectively removes airborne particles. A dirty filter can actually make indoor air quality worse as it acts as a reservoir for dust, dirt and other impurities. You will want to change your filter frequently for improved indoor air quality. Most HVAC systems recirculate indoor air. When the weather is decent, give your HVAC system a break and open a few windows to let in some much-needed fresh air. A clean home is a home that contains less dust and other particles in the air. However, using industrial cleaners to clean your home can result in negative air quality. When possible, use natural cleaning products such as lemon and vinegar that leaves no toxic footprint behind. There are several studies that show frequent and regular vacuuming and dusting can significantly reduce harmful allergens, mites and dust that invade your indoor air. Scented candles and sprays can be irritants to your lungs. Your best bet is to find the source of the offensive odor and get rid of it. Keeping your home less humid will help protect it against mold and mildew. It is best if you keep the humidity in your home under 50 percent. Doormats do a fine job keeping dirt, dust and other pollutants from making it indoors. You should have two doormats at every exit, one placed outside the door and one placed right inside the door. You should also have a policy of having everybody who enters your home to remove their shoes. Shoes drag in all sorts of unwanted pollutants. Following these indoor air quality tips isn’t all that difficult and they will make a big difference in the air quality inside your home. Call Momentum AC for more details.